Go Hydrology! : Florida's meteorological "four horsemen"
Can you hear the apocalyptic atmospheric stampede? Not to worry -- the world is not coming to an end. 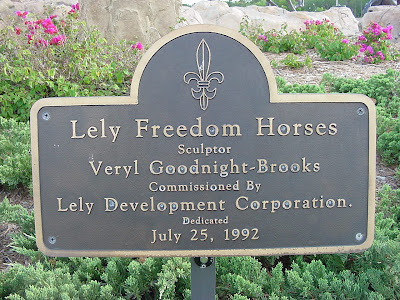 It's just the sound of one of Florida's four horsemen galloping across the sky. Who exactly are the Four Horsemen you may ask? The first is our old faithful of the summer: the Enhanced Sea Breeze. I’m not talking your any day old run of the mill sea breeze. This is the one that, with a little help of upper level atmospheric instability and a Gulf flyover of a deep dipping Jet Stream – two factors that puts extra wind behind the sails of the sea breeze, creates our gargantuan Kilimanjaros rising out of the Everglades and the famed morning showers offshore of Miami. The second horseman is the Continental Front. The thunderous squadrons of clouds that they bring, often leaving cold air in their wake, are typically a dry season event. But they’re not unheard of in the early summer season. That’s what makes June such a critical rainfall month for south Florida. Lingering springtime instability up on the continent – both in the upper and lower atmosphere – juices the early part of the rainy season, from Memorial Day to Forth of July. Once July roles around, a more homogeneous air mass takes hold across the southern peninsula. Trade winds blowing due east off the Bermuda High become the prevailing wind pattern. It’s the Bermuda High that paves the path for the third horseman, and the scariest: the Cape Verde. These are the mammoth hurricanes that spawn off the coast of Africa, and head west around the perimeter of the Bermuda High. This one packs the full punch – horizontal rains, instantaneous – if only momentary – sea level rise, and tree-toppling winds. And this is no sucker punch – it broadcasts its potential fury days in advance, but it keeps its exact landfall a secret until the day approaches, and I use the term “day” only in calendar sense, because once the Cape Verde stampedes to shore, it turns daylight into night, other than a brief glimpse of daylight at its eye. That’s its prelude to the second half of its 1-2 punch, more commonly known as its knock out blow. The fourth horseman is the Tropical Tempest from the Gulf and from the Caribbean. Usually not as scary as the Cape Verde, they play a prominent role in the early and late part of the hurricane season. Don’t be overly concerned with the magnitude of these, because even a disorganized wave of tropical moisture can give us the coveted BRD – Big Rain Day, as coined by the District’s Meteorology team. In technical terms, that's a sFL-wide daily rainfall total of more than 1 inch. Geoff Shaughnessy tells me we need 6 BRDs to keep the annual water coffers filled. Florida’s four meteorological horsemen are each ominous in their own way, but after a long dry season their hooves, too, are music to water managers' ears. Finally, aquifers and wetlands can start to refill. But come high water the same horsemen are cause for concern. They are a wild breed. Yes, you can tame the landscape upon which they roam with levees and canals only so much. The horsemen in their full fury have a reputation of running roughshod over civilization's carefully laid plans. 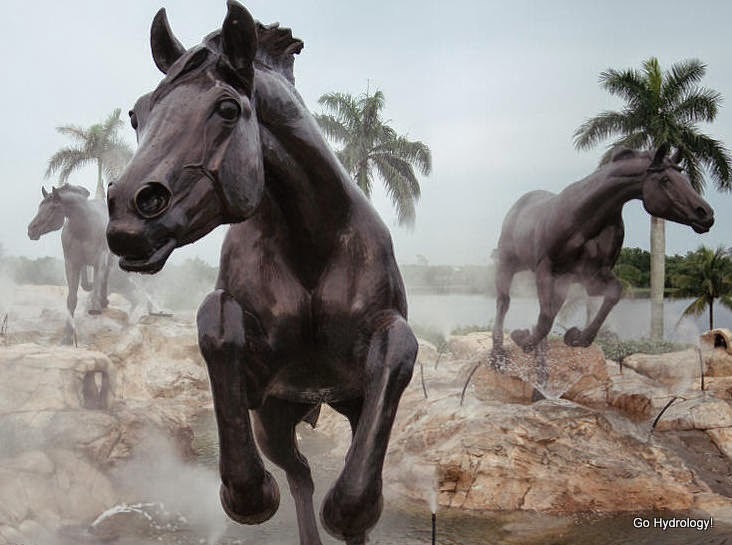 five 1 1/4 life sized running horses for the entrance to their luxury country club community in Naples, Florida. But mostly the four horseman are fun to watch (and hear) from a distance. Just be sure to take good cover when they run near!